4) The components of a double muffle incineration furnace have been sent by error to Auschwitz by Topf & Sons, whereas they were in fact intended for Mauthausen. Engineer Prüfer suggests installing the furnace here. The 2 charging doors and the 2 ash removal doors that are missing could be borrowed in the meantime from the consignment of 5 3 muffle cremation furnaces. 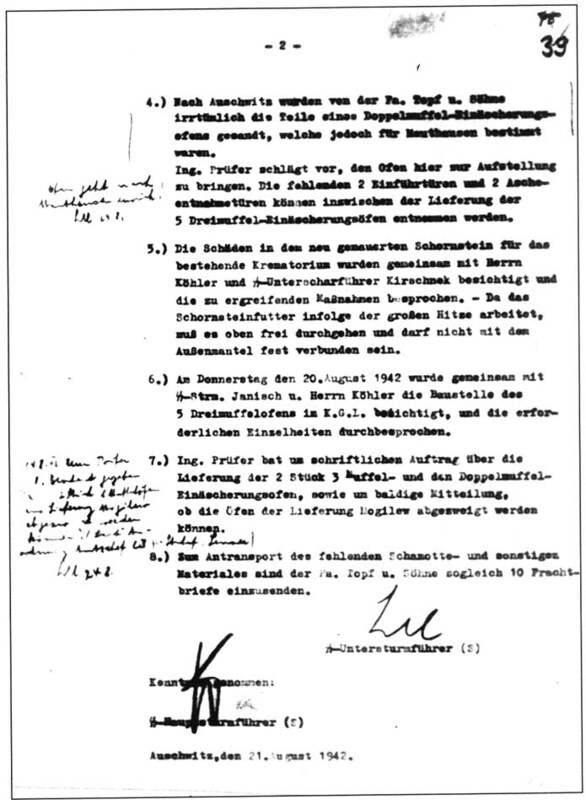 5) The damage to the new brickwork of the chimney for the existing Krematorium [Kr I in the Stammlager] was examined by Herr Kohler and SS Sergeant Kirschne[c]k who discussed what measures to take. As the chimney lining works because of the great heat, it must be free in the upper part and not firmly bonded to the external brickwork. 6) On Thursday 20th August 1942, the worksite for the 5 3 muffle furnaces in the POW camp [BW 30] was visited by SS Corporal Janisch and Herr Kohler and the necessary details were discussed. 7) Eng. Prüfer requested a written order for the delivery of the 2 3 muffle furnaces and the double muffle incineration furnace and a rapid decision on whether the furnaces are to be taken from the consignment attended for Mogilew. 8) 10 transport authorizations are to be immediately sent to Topf & Sons for delivery of the refractory and other missing materials.